Library is where all your files are kept, you can use these files when designing slides or adding background music to playlists. Files can be either uploaded directly to our servers or by pasting a web URL of the file. You can also create folders to organize the files better. .png – Recommended file format for computer generated graphics, supports transparency. .jpg .jpeg – Recommended file format for photos. .gif – Animated gif files don’t play, they show only the first frame. Images are supported, but not recommended as gif images are limited to 256 colors. .tif .tiff – Files are automatically converted to jpg. .svg – Recommended file format for vector graphics as they don’t lose quality when enlarged. .mp4 .m4v – Recommended file format (h.264 or h.265 encoding recommended). If the video bitrate is more than 8Mbit/s, the video is automatically converted to lower bit-rate. A video with a bit-rate of 8Mbit has 1 Megabyte per running second of video, so a 10 second clip is 10 Megabytes and so on. Your videos should take up less space than 1 Megabyte per running second. .ppt .pptx .key .odp – Each slide in presentation is converted to a .png image at 1920 x 1080 resolution (1080 x 1920 for portrait presentations). Unfortunately animation effects are lost because our software is not a PowerPoint playback tool and we can’t have the support for proprietary functionality these tools have. If you design the slides in our editor, you can animate elements as well. Presentations from Google Slides can be embedded with our website plugin – see guide. .woff – Recommended file format for fonts. .ttf – Files are automatically converted to .woff format. .mp3 – Recommended file format for audio. .wav .ogg .m4a .flac – Files are automatically converted to .mp3 format. .pdf – Each page in the file is converted to a .png image at 1080 x 1920 resolution (1920 x 1080 for landscape documents). You can also use website plugin to display the file directly from a web URL. .doc .docx .pages .odt – Each page in the file is converted to a .png image at 1080 x 1920 resolution (1920 x 1080 for landscape documents). Documents from Google Docs can be embedded with website plugin – see guide. .xls .xlsx .numbers .ods – Each page in the file is converted to a .png image with transparent background. You can Spreadsheets from Google Sheets using the website plugin. You can paste the URL of a file, this way you don’t have to download it to your computer first. Our server will download the file directly and a copy of the file will be stored in your library, this way even if the original file is no longer available (maybe it was removed by the owner), you can still use it. The maximum file size is 200 MB, if the file is greater, you should download it to your computer and upload instead. We don’t limit how much files you can store, but rather expect the users not to abuse it. We do monitor it so we can detect abuse use of the free storage offer. The maximum size of one file can be up to 2 GB. PDF files, presentations and documents can contain up to 50 pages, larger files should be split before uploading. How to move files between folders? When you enter multi-select mode, an option to cut files appears. After you cut the files, navigate to folder where you want to past the files. When you enter multi-select mode, the button to remove files appears. If the files is being used in a playlist, you’ll be prompted to remove the file from the playlist as well. If you select yes, the file will be removed from the slide it was on, but the slide itself will remain in the playlist. It is actually very easy to split PDF files, it is essentially printing a range of pages as a PDF. 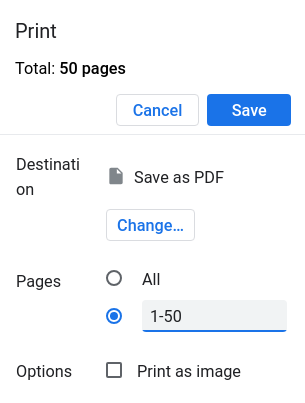 In this example we’ll be using Chrome to open the PDF file and then printing the page (Ctrl/Cmd + P shortcut) and selecting a page range of 1 – 50. Then repeat the process with 51-100 and so on.